If you are building a new house, converting a barn or upgrading your existing home then it is worth thinking about a heat pump installation. Should land be available next to your property you could go for loops of pipe buried one metre down, an alterative, where space is limited, is to have the pipe placed vertically in bore holes or opt for an air source system. 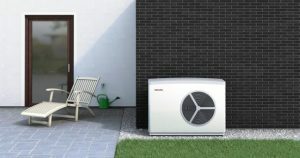 Heat pumps can be connected to under-floor heating pipework or appropriately sized radiators. Whichever method is chosen, and with the correct control system, heat should be supplied in a gradual and continuous manner considering the outdoor temperature at the time to provide just the right amount of heat to keep the house at a comfortable temperature throughout the year. Thorpe Eco will educate you the customer in the use of this new type of heating in the UK and make sure the correct, efficient and sustainable system is right for you and your application.